You are possessed of free will. Use it. Martin Heidegger (1889-1976) was the German philosopher who developed existential phenomenology and has been widely regarded as the most original 20th-century philosopher. Heidegger was born in Messkirch, Baden, on September 22, 1889. He studied Roman Catholic theology and then philosophy at the University of Freiburg, where he was a student of Edmund Husserl, the founder of phenomenology and all-round great guy. Heidegger began teaching at Freiburg in 1915. After teaching at Marburg, he became a professor of philosophy at Freiburg in 1928. More importantly, you can now print out this picture of Martin, cut it out and dress him in a variety of clothes. 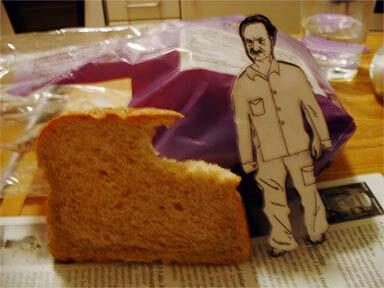 I promised that I would award a prize to the first person to print out the Heidegger pic, cut it out and photograph it. Finally, someone has done it. The winner is Alexander from Sweden. Here is his photograph. I have not yet decided what Alexander's prize will be.